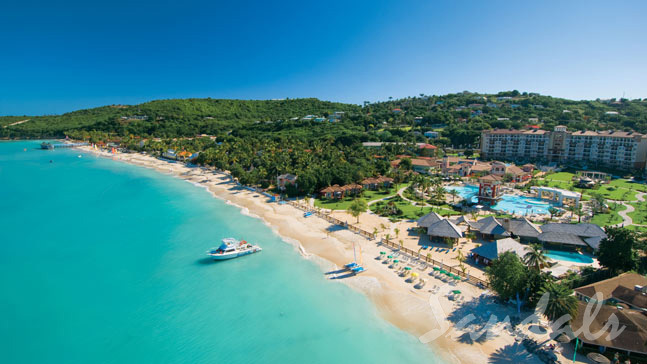 Blessed with 365 beaches and miles of green pastureland, Antigua has surprising variety for such a small island. History buffs will enjoy Nelson's Dockyard and underwater explorers will discover rich coral reefs and a shipwreck. Trade winds keep humidity low and temperatures comfortable. 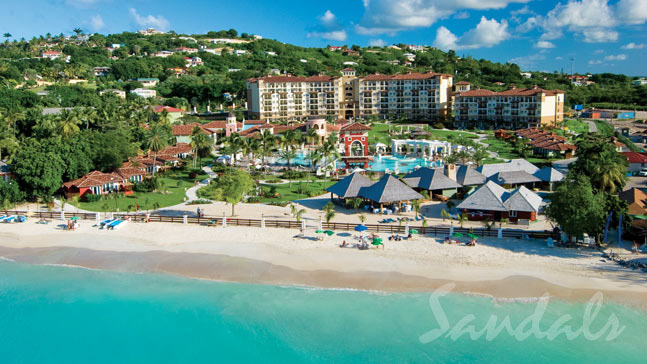 Voted "World's Most Romantic Resort" 12 years in a row, Sandals Grande Antigua Resort & Spa beckons with two extraordinary vacations in one on Antigua's best and most famous beach, Dickenson Bay. Cooling trade winds soothe the soul as you immerse yourself in a seaside garden oasis graced by majestic palms at the authentic Caribbean Grove. Savor the sophistication of a fine European Hotel in the Six-Star, all-suite Mediterranean Village. Awaken your most sensual side in an exotic Rondoval with its soaring 20-foot conical roof and spacious circular floor plan; or languish in the luxury of a 1400 square foot Mediterranean villa — both with private plunge pool and your own butler. 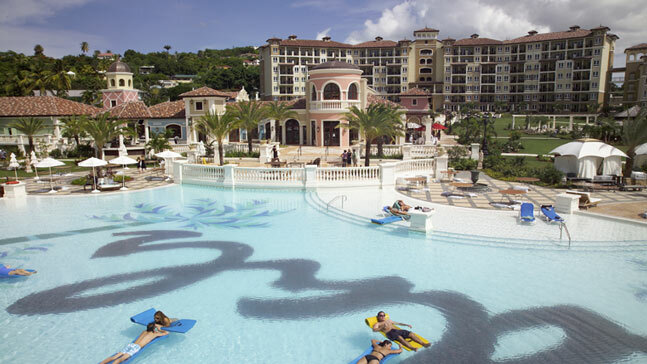 Unwind in the East Caribbean's largest pool (one of six). Celebrate the high art of food and drink with world-class faire and intimate settings at nine restaurants and eight bars including an English pub. A night out on the resort is really like a night out on the town. Whether you're dining on classic Italian, sumptuous sushi, or a sizzling steak, Aphrodite presides over every meal as you share the most romantic vacation of a lifetime. Two perfect worlds in one grande resort all designed for love. 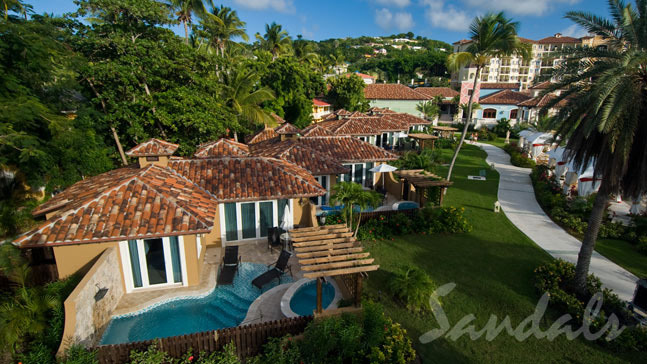 The open landscape, grand piazzas and classical styling of the Mediterranean Village contrast with the lush green canopy, low-lying villas and diverse flora of the Caribbean Grove. Refrigerator in all rooms and suites with bottled water and soda's. Features: Situated on Antigua's best beach, Two Vacations in One, 11 dining options, Gambling next door; Villa's and Rondovals with private plunge pools; Entry level butler category excellent value in the Eastern Caribbean. 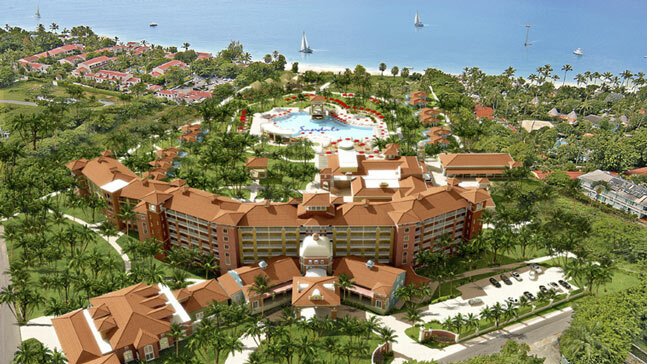 2012: All Beachfront Rondovals have been fully renovated including larger bathrooms with rain showers. A fire pit with chairbeds has been added near the Barefoot Restaurant. A new and popular Cafe de Paris Patisserie has been added to this resort.